When a senator's daughter is killed, the secret life of prostitution she'd been leading is revealed. The high-profile case takes Lieutenant Eve Dallas into the rarefied circles of Washing-ton politics and society. Further complicating matters is Eve's growing attraction to Roarke, who is one of the wealthiest and most influential men on the planet, devilishly handsome... and the leading suspect in the investigation. I’ve done with this series something I’ve never done before, jumped right in with the latest installment and skipped everything that came before. I soon realized my mistake, though. While each book can easily function as a standalone, missing even a word of this enchanting series is a crime. So here I am, going back to the beginning, meeting Eve and Roarke in their early days and sharing their journey from the start. Naked in Death was first released in 1995, but it’s still fresh and innovative today, which tells you everything you need to know about it. It’s set in a futuristic version of New York, 2058 to be precise, but the reality isn’t so different from today. Yes, people have expanded their activities and moved some of them to various other planets, and technological developments have moved forward just enough to make them interesting even 20 years later, but human nature has more or less remained the same. Enter Lieutenant Eve Dallas, a competent homicide detective. She handles the most complicated cases with unwavering dedication and a strong sense of justice. Her own past is incredibly painful, which left her emotionally closed off, but when it comes to her victims, Eve has all the compassion in the world. In Naked in Death, Eve investigates the murders of three prostitutes. Cold, vicious, calculated crimes, all videotaped and left for her to find. Her investigation takes straight to one of the richest men in the world – Roarke – but as hard as she tries, Eve just can’t see the honest, competent man as her killer. Naked in Death has a strong romance, yes, but it’s so much more than that. The case Eve investigates isn’t just something to fill the pages between romantic encounters. If anything, it’s the other way around. These murders are painful, well planned and with a huge emotional impact for both Eve and the reader. In addition, Robb gives us splendid characterization on multiple fronts. It’s obvious even in this first installment that she’s building her characters to last. This series is up to its 40th installment now, and each one is better than the last. There is no noticeable decline in quality or intensity, which is not only rare, but absolutely brilliant as well. The descriptions can be a bit wordy at times, but they only add to the impression that we’re dealing with much more than a simple murder mystery/romantic suspense. After all, this is Nora Roberts we’re talking about. She can do so much more than that. I found four books over the weekend. Yay! Still on the hunt for the early books, though. Oh and I agree with everything that you've said about this book. I don't think I could ever do what you did though. I don't think I could start from the latest . Imagine missing the meeting of these two?! I love their beginning! 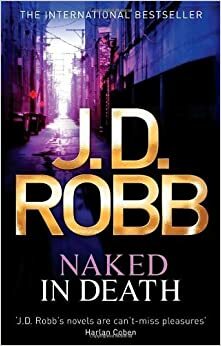 I'm so excited you are starting this series, I adore Eve and Roarke! They truly are my most favorite couple. I love mystery thrillers that dig into the real issues that are present in the world around us. I can't believe that this series is in its 40th installment though! Wow! Have you read each one? I have like 30 books in the Eve Dallas series (yes that's true) and I haven't read any of them but I r eally should, everyone is loving them and I confess that I'm curious now too. Gosh 40 installments! You're making me want to read some of these books for certain, Maja. I love the sound of the story and the characters seem like ones I would enjoy. I'll have to look more into these books and see if I can snag them from the library. WOO HOO!!!!! I absolutely adore this series Maja, though I stopped somewhere in the teens and need to get caught up. Can you believe there are 40 books in this series and it's still going strong? Amazing. Eve and Roarke are something special for sure! First off, huge NR fan. I've read most of her romances. I read the first five or six of these and was frustrated by the lack of Eve and Roarke's character development within and between books. But maybe by now that's happened? Maybe this summer I should find out. I really need to read more adult books. I think I'm stuck in YA/NA that I don't care to look at books such as these. Working in a library I know that NR is a HUGE author and so many people love her. I must see what this series is about. I certainly love the sound of Roarke! Great review. I just read my first Nora Roberts book in March and I am eager to try more. This series intimidates me because it is on the 40th installment, but now I am encouraged after reading your review. Obviously she must be doing something right if she can release that many books and kept it fresh. After reading your review for the last book in the series I got myself the first two, so I'm really glad to hear that reading the first one for you was great! We do have a lot of material to keep us entertained for sure! Ooh I need to read this series! Like you I definitely will be tempted to jump right in to a more recent book, but now I'm definitely going to make myself go back to this. It's amazing that this can remain so fresh and relevant 20 years later. Excellent review Maja! I just finished reading this one the other day! I do agree that despite being written and published 15 years ago, it still has a modern feel to it. You wouldn't even think it was written that long ago, to be honest, and that's what I like about it mostly - because the writing and language just transcends time. I also loved Eve, although I am not sure about the fact she and Roark had an insta-love ish thing going on. Can't wait to read the next book though! I'm seeing the author everywhere lately and I'm at the point where I'm like WTF IS UP WITH ROBB??? I love this series I have read the first twenty or so books then I jumped to the last three, I do mean to go back and fill in the gaps. This can totally be read as a stand alone but the whole series is just amazing, great plots and great characters.